Burns occur when the skin is damaged as a result of contact or exposure to heat; burns range from minor scalds to severe damage, which can result in permanent scarring and disfiguration. Most people have scalded or burned themselves at some point and the first symptom is pain; burns are very painful and often it takes a long time for the pain to subside. 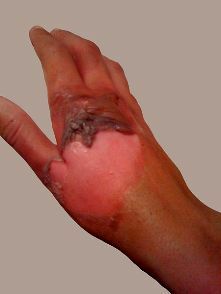 Burns also cause blisters to develop and in severe cases, the skin may look charred, black, and very bright red. Serious burns cause the skin to look disfigured. First aid treatment for burns should include running cold water on the site of the burn or applying a damp towel to the burn; the individual should be moved away from the heat source as quickly as possible. If the individual is wearing clothing that is stuck to the burnt skin, do not try and remove the clothing, as this could cause further damage to the skin and also a lot of pain. Try to keep the person warm by wrapping a blanket around them, but take care not to put the fabric near the burnt skin. In the case of severe burns, the patient will require hospital treatment and you may need to get emergency help if the burn has severely damaged the skin, if the patient has chemical or electrical burns and if the burn has affected an entire joint or a large area of the body. In hospital, doctors will asses the burns and decide on an appropriate course of action; some people lose a lot of fluid through the burned skin and this may be replaced using a drip. There is also a risk of infection in some cases and doctors may prescribe antibiotics. In very serious cases, the patient may be referred to a specialist burns unit, where they will receive round-the-clock specialist care for their injuries. Skin grafting, a procedure that involves taking skin from an unaffected area of the body and placing it on the affected site, may be used to improve the aesthetics of the skin and to try and repair damaged skin that has not healed independently. Burns are graded according to the severity of the injury; if the upper layers of skin are damaged, this is known as a superficial burn. If the burn damages the upper and deeper layers of the skin (the epidermis and the dermis), this is known as partial-thickness burns and if the burn has damaged all layers of the skin, this is known as full thickness burns. Severe burns do not just affect your body, they can also affect your mind; in cases where the skin has suffered serious damage, it may look completely different and this can affect your confidence; you may feel like you look completely different to other people, you may be conscious of your scars and you may feel uncomfortable meeting new people or seeing your friends and relatives. Counselling can be very helpful, not just to help you overcome the fact that you suffered major injuries and you were involved in a traumatic accident or event, but also to try and build your confidence and help you to feel more comfortable around other people. Physiotherapy can be very effective for people who have suffered joint injuries and burns; physiotherapy is designed to build your strength and increase your mobility, agility and flexibility. Exercises aim to build up your strength gradually and the treatment plan will be tailored to your individual needs. Surgery may be advised for people who have suffered extensive damage to the skin; surgery has aesthetic and functional benefits and may help you to feel more confident about the way your skin looks. Surgery usually involves grafting skin from one part of your body to help the burned skin to recover. Your doctor will discuss surgery with you and answer any questions you have about skin grafting. After suffering severe burns, you will be advised to rest, take it easy and avoid sun exposure. If you have any worries, or you need to talk to somebody about your injuries, your doctor and care team are there to help. Anna Hewitt is an experienced writer who enjoys writing about her field of dermatology and skin conditions. She wrote this article on behalf of www.dermatologist.org.uk.